That hilarious episode is memorable probably because it’s so true. Feeling a sense of serenity during a quiet moment of meditation is one thing; having serenity during the noisy challenges of everyday life is quite another. 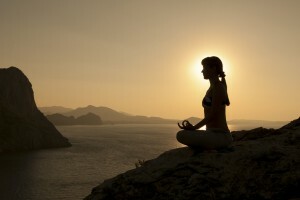 In fact, it has been my experience that learning to calm the mind through a meditative technique, such as focusing on our breathing, is difficult enough – even when the external conditions are conducive to serenity. Once one leaves that temporary cocoon of quiet and calm, it is remarkable just how fast that sense of serenity can go right out the window at the first sign of a challenge. Perhaps that’s why the Universe decided to send in the big guns, in terms of teachers, to teach me about meditation when it is NOT quiet. Now, for the past three years, my ever-so-patient massage therapist and good friend, Andrea, has had to listen to my woes, on pretty much a weekly basis, about my noisy neighbours. First it was the pounding bass from the girl’s stereo – every day for five hours. Now it’s the guy using his beloved band saw in the backyard, outside my office window, and the screaming kids. Over the years, Andrea (and others) has tried explaining to me that moving is not the answer – because if I don’t learn what I need to learn in this situation, I will only find myself facing the same problem in a new location. “It’s you who has to change,” she said. “So then they’re the ones who should change!” I cried. “You need to learn how to stop all the drama you’re creating around the noise,” she said. To this end, Andrea suggested I attend a Buddhist meditation session at the library around the corner from where I live. That was a year ago. Funny how we put off doing the very thing that will probably help us the most. But then, last Monday, when the new fall meditation session started, I decided to give it a try. Andrea even made plans to join me, so she could introduce me to the Monk…or so she said. She probably just wanted to make sure I actually went! For Monday morning is prime-time writing for me…I’m at my most rested and alert to get my work done. Taking 90 minutes to listen to a Buddhist Monk and meditate seemed a bit…well, you know – perhaps not the most effective use of a Monday morning. And then wouldn’t you know it but, as if on cue, the landscaping guys working at the condos behind my backyard started up their industrial strength weed-whackers. They usually show up on Friday mornings to annoy me. So I calmly put on my runners and walked around the corner to meet my Monk. After Andrea introduced us, we took our seats. Hmmm, I thought to myself, a magic Monk. Then, I kid you not – a jackhammer starts up outside the library window. Wow…this guy is good! At first, the Monk didn’t even acknowledge the noise. He just kept on talking about how easy it is to get wrapped up in our negative feelings towards whatever it is we may be dealing with. I turned and looked at Andrea, my mouth hanging open. “You ignore it,” the Monk said, answering his own question. I looked back at him, incredulous. IGNORE IT?! How the heck do you ignore a jackhammer outside the window when you’re trying to learn meditation? I thought back to the times I’d fantasized about shoving my neighbour’s band saw – or stereo – where the sun don’t shine 🙁 Oops. That could possibly be construed as a rather negative thought…but it sure felt good at the time! I smiled back. Message received. Then we did some breathing meditations where we focused on breathing in and out, in and out. He advised us to just ignore everything else that was happening around us, such as noises and movement, and in us – such as thoughts. Whenever our mind began to wander, we were to just gently bring our focus back to our breathing. The Monk explained that meditation is simply a tool used to train the mind to be calm, so that when the inevitable stresses, challenges and irritations of every day life happen, our minds will eventually automatically default to that calm state – instead of reacting with thoughts, feelings and all the damn drama. Mastering meditation obviously isn’t going to happen overnight – or the next decade for that matter. But I am already astounded at the difference in the quality of my day when I choose to walk away, or put in earplugs, whenever an annoying noise starts up around me – instead of allowing it to trigger negative thoughts that lead to feelings of anger and frustration. In the bigger picture, the ever-unfolding saga next door is brilliant writing material! As such, I’m saving the drama in my head for the page – and have started writing a hilarious play about the situation, aptly titled, The Neighbours. And speaking of the bigger picture, since we are supposed to learn to love thy neighbour, maybe that’s why we don’t always get the neighbours that are easy to love. Thankfully, I’ve been blessed to mostly have that kind. But perhaps the real test is to learn to love the not-so-loveable neighbours? Now that’s a worthy challenge. Because the hate I have felt for my noisy neighbours is no different than the hate that people at war in all corners of the globe have for each other – and kill each other for. Peace is peace…and if we can’t find it in own hearts and minds then we will never be able to achieve it on the world stage. I learned that in this week’s meditation session. Maryanne Pope is the CEO of Pink Gazelle Productions and Chair of the John Petropoulos Memorial Fund. She is the author of A Widow’s Awakening and the playwright of Saviour. If you would like to receive Maryanne’s weekly blog, please sign up here. So fabulous! I need to apply these lessons to my own environment. I am beyond thrilled that you like our “magic” monk. Didn’t he say that when you finish the 14 week programme, you will be enlightened? Only 12 more weeks to Nirvana, baby! Ever since our amazing trip to India 11 years ago, Maryanne, I’ve been intrigued by Buddism and meditating. Yet I too have put it off. There never seams to be time for that and it doesn’t seem very exciting to sit there and do nothing. Yet I probably could really benefit from it. And maybe I’ll check several things off my list and actually look into it this winter. Procrastination and meditation. Hi Jackie! I was totally thinking of our trip to India this week, too, while writing that blog about meditation. For the first time, I really am starting to get a sense of the “why” about meditation…versus just the how. And what a difference that is making! Thanks, Andrea…both for the kind words about my writing AND for introducing me to the Monk! 12 weeks and 3 more lifetimes is probably more like it before I reach Nirvana. ahahahaha! I just read this article and feel SO supported by the universe right now. Both my boyfriend and I are having challenges with our room-mates at the moment which is new for both of us. Your article spoke of things I already know and teach (so I resonate completely). And, today, I really, really needed to hear it from someone else. THANK YOU! Thanks for the feedback, Ann! And yes, it is rather incredible how we all seem to be potential teachers and students to each other, depending on the circumstances and the lessons we need to learn.